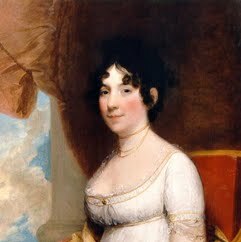 Dolley Payne Todd Madison was the wife of James Madison, President of the United States from 1809 to 1817. She was noted for her social gifts, which boosted her husband’s popularity as President. In this way, she did much to define the role of the President’s spouse, known only much later by the title First Lady—a function she had sometimes performed earlier for the widowed Jefferson. Dolley Madison also helped to furnish the newly constructed White House. When the British set fire to it in 1814, she was credited with saving the classic portrait of George Washington. In widowhood, she often lived in poverty, partially relieved by the sale of her late husband’s papers.